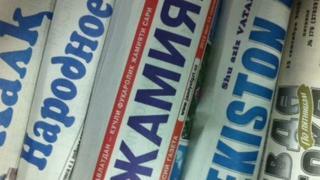 Children in some schools in Uzbekistan are denied textbooks if they don't subscribe to state-run newspapers, a report claims. Pupils are reportedly told to buy titles such as The Village Pravda and The Oriental Pravda, the government's official organ. The newspapers' names hark back to the Soviet era, when Pravda daily was the Communist Party's official mouthpiece. The move appears to come in response to orders from local administrations, which demand that hundreds of copies of newspapers be sold at schools and colleges, according to the agency 12 News. "Pay subscription fees first, get your textbooks later," it says. Uzbekistan has one of the world's most tightly-controlled media environments and remains a "nightmare for journalists", according to Reporters without Borders, a media freedom watchdog. Subscribing to official propaganda may not be the worst thing Uzbek children have to do. The government in Tashkent has been accused by campaign group Human Rights Watch of forcing children as young as nine to pick cotton, a major export for Uzbekistan.